Extra! 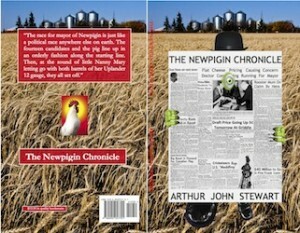 Get your print copy of The Newpigin Chronicle here. So far, this is the only location in the world, if not the universe, where one of these authentic, very limited, print editions of The Newpigin Chronicle can be purchased. I know it may be argued in some quarters, that with so many other galaxies and parallel dimensions, I can’t really be sure that this exact book has not been published elsewhere. I accept that possibility completely, but as far as this particular world goes, I have the only bonafide copies, as well as the means to deliver the book in less than a lifetime — barring a postal strike. If you would like to purchase a copy of this book, for whatever reason — there’ll be no awkward questions** asked — please use one of the buttons below. **The book will arrive discreetly inside a plain brown wrapper. Canadian customers use this button to buy. American customers use the button below to buy. Unfortunately, the cost of posting a book to the United States is significantly higher. I have reduced the cost of the book in an attempt to slightly mediate that difference.